Road: Twenty-two km from Pune off the Pune-Solapur highway. Rail: Five km from Loni Railway station on the Pune-Solapur section. The temple faces the north. Swayambhu (self-generated) idol with the trunk to the left. Bhadrapada Shukla 4. Punyatithi of Ramabai Kartika Krishna 4. 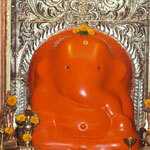 Ganesha is believed to have got back the precious Chinatamani jewel from the greedy Guna for sage Kapila at this spot. Moraya Gosavi attained his siddhis (spiritual powers) here. This was the favourite temple of Shrimant Madhavarao Peshwe. He stayed here during his last illness and breathed his last near the temple. Ramabai performed sati close by.